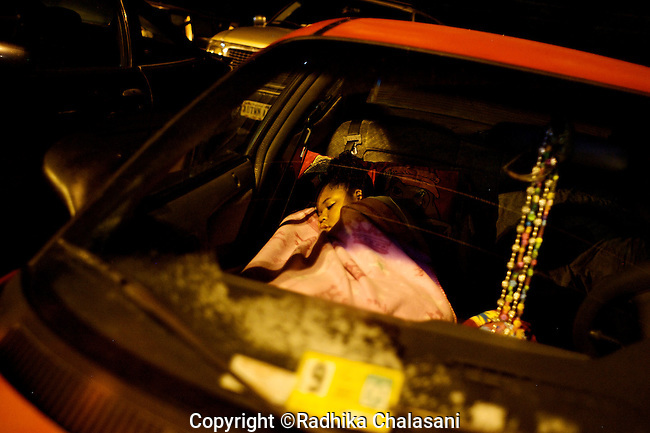 WISE, VIRGINIA-JULY 26: Dayshai (13) Goff sleeps in her mother's car outside the Virginia-Kentucky Fairgrounds to receive free medical care when the gates open at 5:30am at the free makeshift clinic provided by Remote Area Medical (RAM) Expedition July 26, 2009. RAM, operating in 5 states this year as well as overseas, provides free medical, dental and vision care to people in need. Organizers estimate that they spent $250,000 USD to providedover $1.6 million USD worth of care..